Similar to Social Media Revolution, an informative infographic video of Social Media activity in 2011. 11% of the world population have an account. There are more Facebook users (±800mil.) than motor vehicles (±750mil.) in the world. 50% of users log-on daily. The average user spends 700 minutes per month on Facebook. Every 60 seconds: 510 000 posted comments. 293 000 status updates. 136 000 photos uploaded. Ferrari sold 5329 cars last year, but gained 5 267 367 fans. Facebook accounts for 10% of all mobile data on iPhone's. 150 million tweets per day, which equates to 1736 per second. Highest record of tweets per second is 8900. The average user has 115 followers. Lady Gaga has the most followers on Twitter: 15 864 378 followers. 135 million 'users', which is more than 15x the population of New York City. A new member joins LinkedIn every 2 seconds. Membership includes executives from every company listed on the Fortune 500. 92 000 000 000 page views per month, leading to 700 000 000 playbacks recorded last year. 35 hours of video is uploaded per minute. "more video is uploaded to YouTube in 60 days than the 3 major US networks created in 60 years." Justin Bie(what's his name)'s, "Baby" video has had over 659 070 256 views. Flicker: 3500 pictures uploaded per second. Google+: already has more than 50 million users. Instagram: more than 150 million photos have been uploaded. Foursquare: over 2 million check-ins per week. 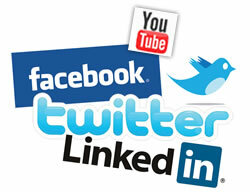 are more active on social media than men (45%).